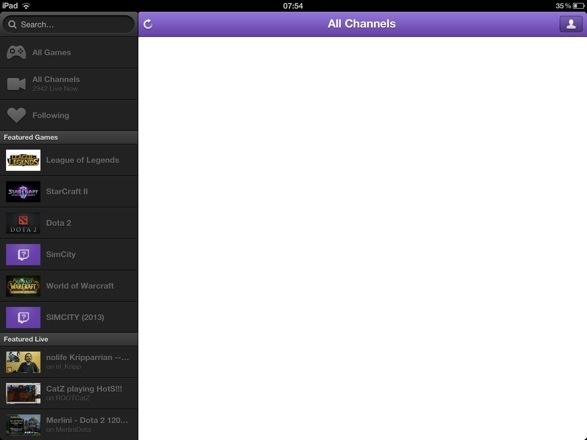 Review : Twitch.TV 2.3 iOS App : Blank Streams and Plenty of Crashes. by Mark — in iOS App Review.Leave a Comment on Review : Twitch.TV 2.3 iOS App : Blank Streams and Plenty of Crashes. Its not uncommon to see and App update that gets you a touch excited when you read the updates. Bug Fixes, new features and all that subtle thing all entice you to hit the update button. in the case of Twitch.TV… DONT. You’ll end up with a worse experience than before. In case you aren’t sure of what Twitch.TV or Justin.TV is about think of it as a portal to watch people playing games along with the ability to chat and interact with the room. Ever since it’s first release Twitch.TV has been a frustrating mess. Poorly implemented features and crashing app was bearable for the times that it worked but this new update is a train wreck. See the below screen shot? That’s what you get i’d say about 70% of the time when you launch Twitch for iOS. Keep stabbing that reload button and eventually you’ll be rewarded with a list of channels. Don’t too excited just yet. Although channels a plenty are listed it doesn’t necessarily mean you’ll be able to watch them. That dreaded black screen of death is still ever more present. These are the ONLY streams that you can watch. If you try and browse channels nothing happens, well apart from the crash which takes it sweet time to happen. Good stuff if only I could watch a stream. Does nothing, nada, zilch. You press that button and wait all you want but previews of streams just refuse to load. Great stuff if you can find a stream that will load. Correct this has been vastly improved although what’s the point if you’re watching a blank stream because the video has once again failed to load. Im not sure if showing a blank screen for any video bar the promoted stream counts as a fix. The list of bugs goes on and on with no response from the people at Twitch.TV. I’m not alone with these problems as you can see by the feedback left for TwitchTV – Justin.tv for iPhone and more tales of woe for TwitchTV for iPad. I’m just left baffled at how something this bug ridden get’s released and then shortly afterwards a premium version, Twitch.TV turbo is published for desktop viewers. Overall. Avoid. Its simply not worth it until the developers do something. A bug that would case the app to freeze up after logging in. Color me sceptical but a release that supports their paid for streaming service (see TwitchTV Turbo coverage). Well here goes nothing (goes off to do the update)..
Well for a brief while things loaded up and I could at least browse the games currently being streamed. All goes well for me right up until I tried to watch something and guess what….. blank screen and then yet another app crash. Next Next post: Review : Jaybird Freedom – The Best Wireless Bluetooth Headphones For iPhone?